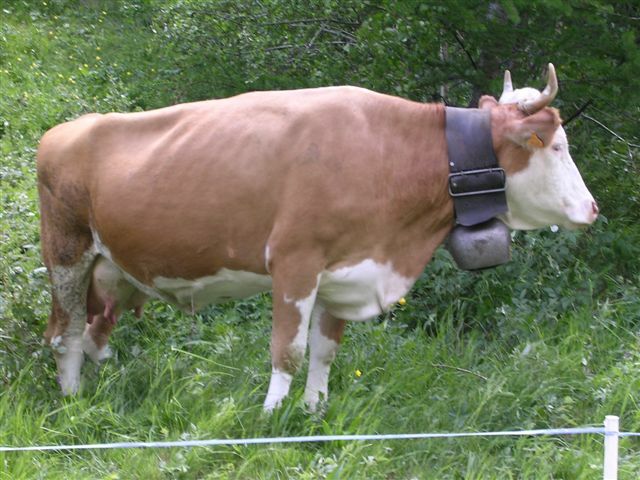 Do the cows in Switzerland really have bells around their necks, or is it just a very clever ploy by the guide books etc. to encourage the gullible tourist to find out? Either way it works, Sylvia and I decided to find out. 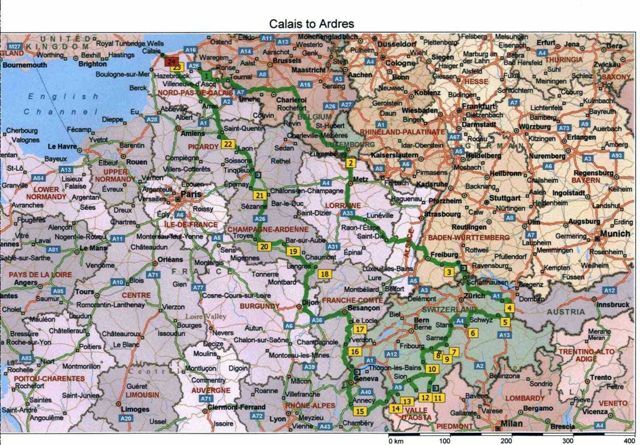 Over a winter spent discussing and rough planning a route that would make an interesting back door entry , (so as to keep surprise on our side) we decided the first week of our six week investigation would be spent travelling down from Calais, along the edge of France and into Belgium, calling in at Luxembourg and the Black Forest of Germany. Saying hello to the corner of Austria , checking out Liechtenstein and beginning our Swiss adventure at Appenzel its far eastern point.So with our trusty motor home ( a 1992 Autohome Avalon)fresh from it s annual service and loaded with the normal spares for foreign travel the van was ready.Next came the paperwork side the Camping and Caravan Club supplying both van breakdown and our personal insurance, CCI and our ferry bookings. We photo copied all our documents, credit cards and Passports and hid the copies in our secret place.We travelled down from our home in Norfolk in late May 2004 , leaving plenty of time for all the things that hold you up, but didn t. So after crossing the palm of the ferry terminal Check In with silver (well 7.50 actually) we caught an earlier boat than booked. WE WERE ON OUR WAY.Having arrived in France earlier than planned we decided to get a few miles under our wheels before our first stop, which was at the comfortable site at Mont Noir. Then onward down the E42 into Belgium (not the best of road surfaces). Next stop was for two nights at Esch Sur Alzette in Luxembourg. Good site, small private zoo next door. An easy walk took us to the town, very modern, clean and serving great mini pizzas.After our two day rest it was on into France again and down to Colmar to enter Germany on the N415 towards Freiburg. Wonderfull wooded drive through part of the Black Forest to spend the night on the lakeside at Titisee. On again next day with slight change of plan, entered Switzerland on A4 near Schaffausen. Sylvia thought it odd but the female border guard seemed more threatening than guards we had encountered elsewhere. Bought our Road Tax Pass for Swiss Francs 40 at the border and drove on to Appenzel for the night. Saw our first cows with proverbial bells, SO IT S TRUE! After our first night in Switzerland we had a walk around the village, which seemed quite text book in its housing and streets. 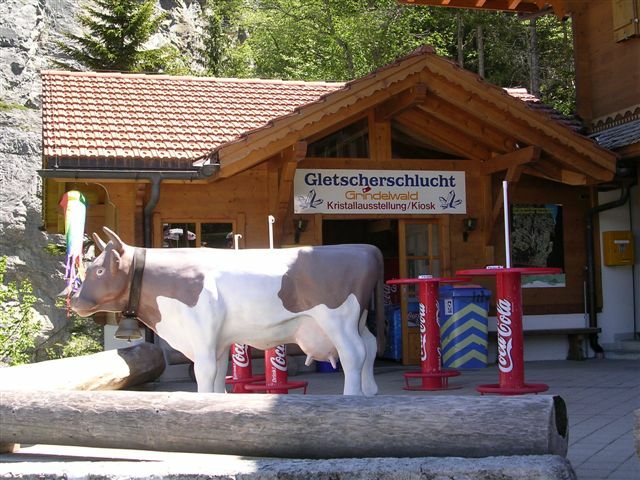 It is also true that the air is filled with the aroma of cattle.Before our Swiss adventure started properly we took a drive over the border into Austria and circled round into Leichtenstein where we strolled around it s capital Vaduz; very affluent, clean, with a friendly feel to it. Several Henry Moore sculptures were used in the public garden displays. Then it was back into Switzerland where we started to feel we were nearer to the bigger snow capped mountains of the Alps. Spent next night at a lakeside site at Walenstadt, a bit noisy with the train station nearby. After more scenic driving we stopped on the shore of Lake Lucerne at Brunnen. It s a glorious place, high mountains all around, the sound of the cows on the hillside; only needed Julie Andrews to appear to complete the picture. As we were to find out at other campsites, the fee includes a local tourist tax, which in turn enables you to discounts or even free admission to local amenities.i.e cable cars, swimming pools, etc. After a couple of days of great high-level walking utilising the cable car to gain height it was time to drive on. 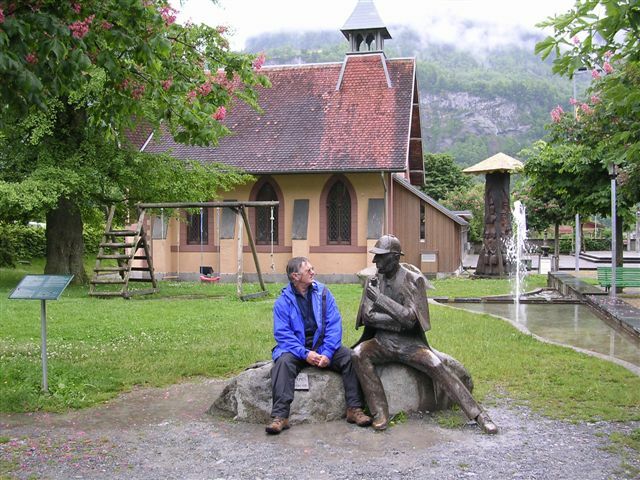 We spent the next two nights at the birthplace of the famous meringue cakes and also where Sherlock Holmes fell to his death with arch enemy Moriarty over a waterfall in the village of Meiringen. They even have a museum for this fictional character!Next stop was on the outskirts of Interlaken with views of the Eiger, Monch and Jungfrau mountains, all snow topped. Whilst the town had its fair share of gift and tourist trade shops, we thought it clean and with a holiday atmosphere. Stayed for a couple of nights then had a short drive to the magic of Grindlewald, our site for the next four days. Camping Gletsherdorf, clean, lovely place alongside flower meadows; easy stroll into village, free swimming in heated indoor pool. Its crowning glory was its position to the mountains; we were nearly within touching distance of the big ones; Eiger north face, the Wetterhorn. 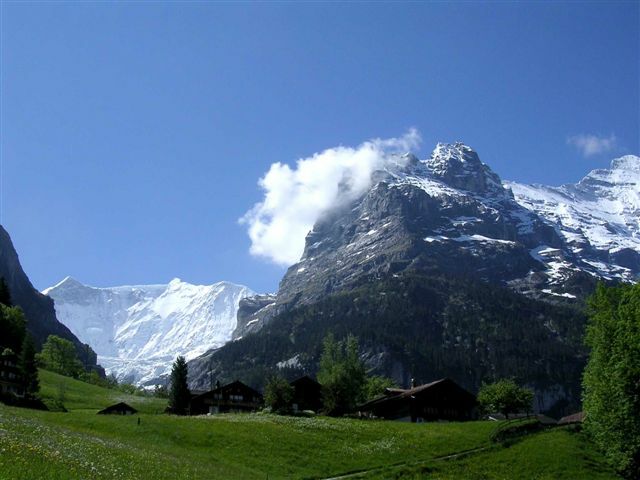 We had an amazing time walking on low and high level walks, up to and above the glacier snow line collecting our rock trophy from the mighty Eiger.Then to carry on with a lovely drive to Kandersteg, to spend three nights again surrounded by mountains. During our stay here we took the chair lift up to Oeschinsee; very impressive alpine pasture with high mountains all around like an amphitheatre with a lake at its centre. 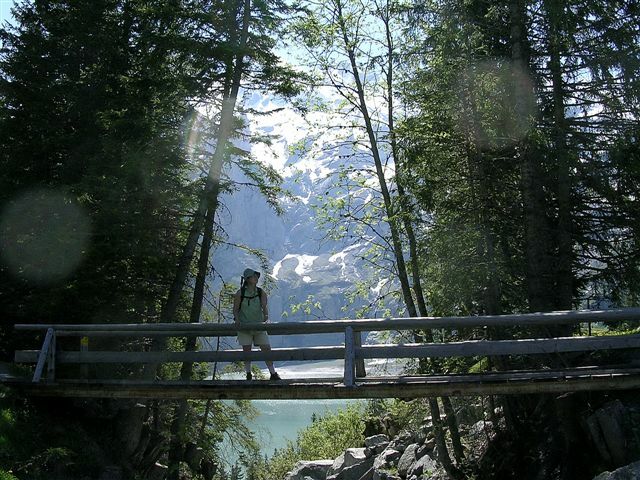 As the sun moved round and warmed the glaciers you heard noises like gun fire as the rocks thawed and tumbled down. Then it was time to drive to the train station in the village and drive onto the train s flat wagon and be taken through the mountain , in darkness, for fifteen minutes to Goppenstein. After which we had a fairly scenic mountainous drive along a quite interesting zig zaggy road to Tasch, the furtherest we could drive south. 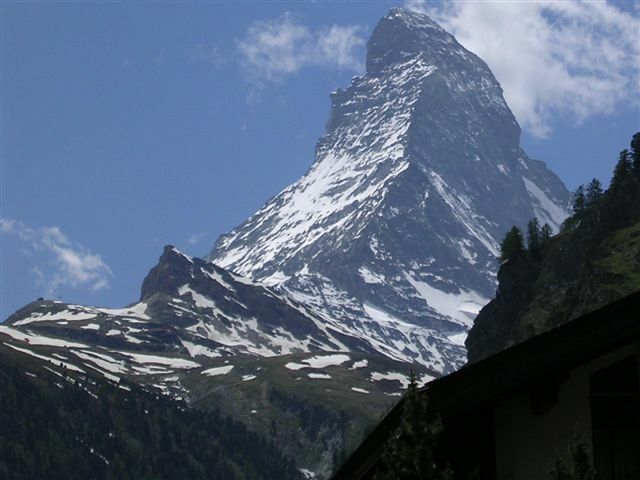 To carry on, we boarded a train and went to Zermatt where, after walking through the very busy town, the awesome Matterhorn in all its glory came into view. We spent two nights at Tasch then drove to go sightseeing at the old town of Sion, a valley town guarded by two chateaus at the valley entrance. It was full of cobbled streets and felt French rather than Swiss. Then we drove through the long wide valley with on one side snow capped mountains and the other vineyards stepped up the mountain side. On then to our next site at Les Hauderea; we stopped on the way for a look at the unusual rock formations called the Pyramides. The village is right at the valley end, with really old wooden houses built on rock legs. Next day s journey was on some of the most challenging and dramatic roads yet. Not having power assisted steering made for quite demanding times with bends so tight you nearly looked up your own exhaust pipe (I said nearly). Finally, we reached Champex, a lovely high mountain village with a crystal clear lake, an alpine garden open to the public, and home for two nights. What goes up must come down. Our track out of Champex was shorter, so steeper, it also was interesting (in a driving way) but enjoyable. Drove the thirty five miles to Chamonix, stopping several times to admire the spectacular views and say farewell to Switzerland. We booked onto the site “Rosieres“, a short stroll along the river from the town, for three nights. We were in a narrow valley with wooded hillside on one side and the Mont Blanc Massif with all it s glaciers on the other; all accessible from the site. Chamonix town itself is wonderful, so French, with an easy going, happy atmosphere. It tends to draw you like a magnet to its many eating and watering holes.Our first trek was on the wooded southern slopes, where we saw our first Chamoix; also a Black Squirrel. From the various clearings you looked across the valley to the the mountains of Mont Blanc and Aiguille du Midi in all their glory. Ate wild strawberries on the way down.Next day dawned bright and sunny, like most of our days so far. We decided to go on an expedition (our expeditions always have a small e ). After walking to and through Chamonix we started up the lower slopes of Mont Blanc on quite steep woodland tracks. As we gained height we also moved nearer to the Bosson Glacier and it became a lot cooler. Eventually we reached a mountain restaurant with splendid views of the glacier right in front of us. 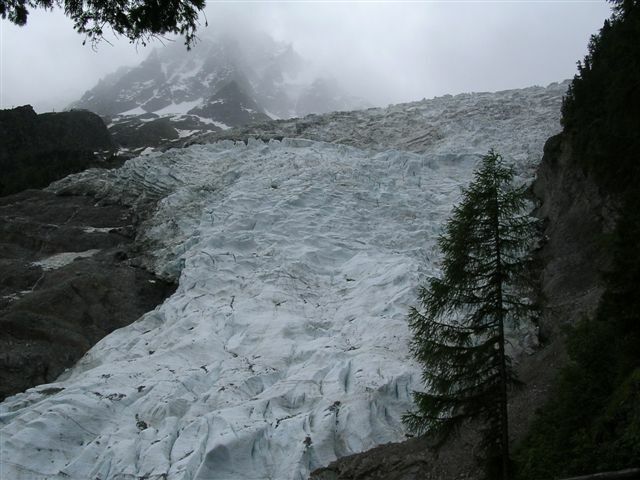 Although the glacier has retreated over recent years it still moves at a rate of half a metre a day. We climbed higher and got nearer to it, it really looked spectacular; you could hear and see the rocks rolling down the side of it, having been freed by the movement. Back to our own base camp van. We couldn t believe that it was possible to camp this close to all this beauty. As usual our van stayed on site during our stay, until the time came to move northwards to Annecy.Received a nice surprise on the way there, each of my three sons texted me wishing Happy Fathers Day, I didn t even know it was then. 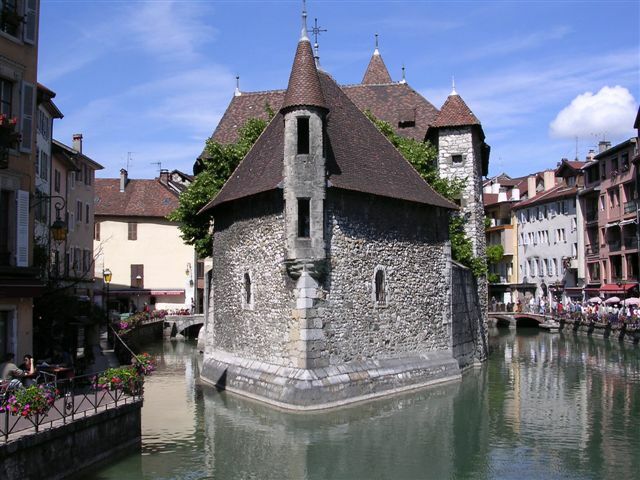 Booked onto La Solitaire site for two nights so as to explore Annecy town and lake. Bused into town and were taken by it s quaintness, with little streets and bridges criss-crossing the river and streams like a little Venice. All the old quarter was pedestrian only. From the town you walk through a park with a huge selection of very mature trees, opening onto Lake Annecy with mountains beyond. A really beautiful setting. After our first game of boules on a French pitch, back at site, we moved on. We drove to Geneve, into Switzerland for a short while on the motorway, then back into France and over the Jura Mountains. Stopped over night at a small village on a hill top with great views across farmland but, alas, no more snowcapped mountains. 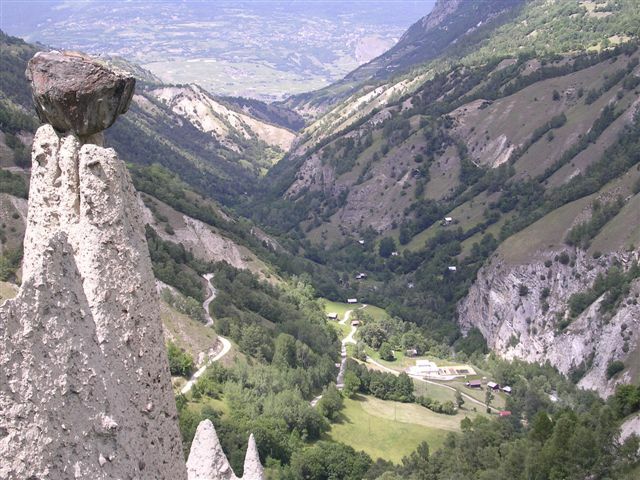 The village was Nozeroy, a medieval once affluent town on the salt route towards Switzerland and Italy. Watched several Red Kite in the evening from the site. Set off for Ornans along the Loue valley; lovely drive steep gorge to start then alongside the river, passing through tiny villages until eventually we reached Ornans. Our walk around the small town was rather disappointing, not at all pretty as described in the guide book and the drains smelt. We did enjoy watching the local men playing boules in the old town centre.Next day it was on to Langres, an old walled town, where you could walk along the upper wall to see views ever changing as you circled the town . Beginning to feel like seasond travellers we moved on to Bar sur Aube, detouring twice on small back roads (once by accident) to explore pretty villages and lovely countryside. Spotted our first Honey Buzzard. We passed General de Gaulles memorial cross, it was massive. Our site there was right next to the river and a ten minute walk into the old time forgotten town; which we did several several times during our stay each time sampling the wonderfully tempting wares in la Patisserie. Met several other British couples on site, one very interesting pair (Ali and Mike) who shared a bottle of red wine with us, had been right up to the Artic Circle and into Russia in their VW van.The next town on our ever northern route was Troyes, where we stayed on a site on the edge of town from which we saw the most spectacular sunsets. Half the people on site seemed to come around to our pitch to see them, as we had the favourite spot (tried charging a Euro per person). The town itself was very old, both houses and shops were like our Tudor buildings all beamed, lathe and plaster, or tiles laid on top of each other to form the wall infills. Most were quite tall, probably four or five levels. A whole day could easily be spent wandering around recharging oneself at the many street caf s.
We had been advised by another English couple on site that if we were to go near the town of Epernay on our journey north, then we should call in to visit the champagne cellars. As this was a convenient distance away we decided to make it our next stopping place. So, after a pleasant drive through vineyards which were owned by several of the big names in Champagne, we arrived at the famous premises of Mercier Champagne, founded in 1858. After signing up for the tour we were taken thirty metres below ground in a lift which was backlit through glass to show scenes depicting our descent. We were then driven around part of the twelve kilometres of caves with shelves of bottles lining the route. Then it was back to the surface for a sample and purchase if you wished. A very interesting and worthwhile outing. On our journey homeward we tried to keep to the back roads, where possible, to see the small villages, mostly unchanged for maybe a century (except for road signs and the like). It was in one such village we saw this church on a green, with a huge carving on the front stone wall. Keen to find out more, we went in; the doors, as with every church or cathedral we visited abroad, being open. Inside was simplicity itself, but the walls were covered with old wall drawings and paintings and the crowning impact was given by the colour blue. 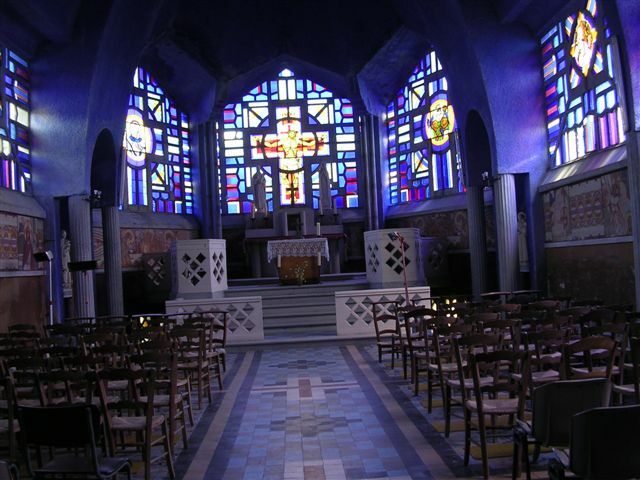 The stained glass windows, the upper walls and the inside roof were all cobalt blue. So if you ever go through Monthenault, call in. By contrast in size we then called at the town of Laon where we climbed over two hundred steps to the old part of the town and visited the cathedral. Here again open doors and no charge. Although containing some marvellous carved stonework it also had an air of peace and simply being there for all. After staying overnight at the little village of Seraucourt le Grand on a lovely small site next to the river, we had a full day of travelling to arrive at our last site at Ardres near Calais. After spending a couple of days deciding whether to turn round, turn right and head for Holland, or return home, we stocked up with alcoholic liquids and caught the ferry home.Much fitter and a lot wiser. SUMMARY : During our six weeks we stayed on a total of twenty three campsites, all of a good standard and with friendly and helpful staff they all helped to make the holiday memorable. Because all the sites were next to, or near to the area we wished to explore we only moved the van once whilst on any site. This was at Ardres, to top up our wine lockers for the return home. 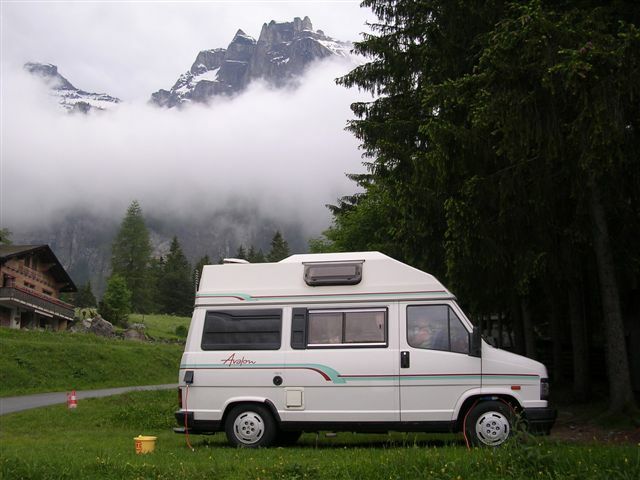 This trip in 2004 was to be the first of many more memorably Swiss adventures in our faithful Avalon over the next few years. 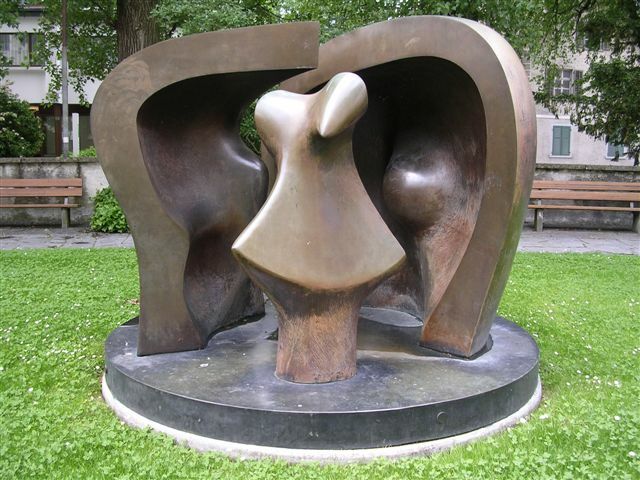 This entry was posted in Belgium, Leichtenstein, Luxembourg, Switzerland. Bookmark the permalink. ← A Weekend on the Wild Side.